Rooflights offer a great deal of scope for adding a stylish and contemporary feel to your space. Alongside an eye-catching aesthetic, energy efficiency is paramount, and there are countless reasons why making the decision to choose eco-friendly rooflights is a wise one. Installing eco-friendly rooflights in your home offers a host of benefits. Let’s take a look at five of them. It has been proven that total energy usage in UK homes has increased by 25% since 1970. It is crucial that property owners harness energy-saving methods to reduce consumption and lower this alarming figure. There are numerous methods that homeowners can adopt to reduce the amount of energy being consumed in their properties. Installing eco-friendly home rooflights is one solution. Their triple glazing reduces energy wastage and consumption, making these rooflights a highly efficient and energy-saving lighting choice. The money-saving properties of eco-friendly rooflights make them an appealing choice. Effectively reducing the need for artificial lighting by incorporating rooflights into your home maximises energy savings, ensuring your money stays in your pocket instead of being spent on energy bills. The Part L Building Regulations are a piece of legislation that focuses on saving energy and reducing power consumption in buildings. Carbon emission reductions are a critical factor in achieving this standard. This legislation states that in order to achieve this standard, major savings must come from building services, including lighting. Installing eco-friendly rooflights in your home assists in the reduction of carbon emissions, and therefore contributes to Part L Building Regulations compliance. No one likes spending too much time in an environment which is artificially lit; natural sunlight is a brighter, far cleaner and more eco-friendly source of power. Installing eco-friendly rooflights means you are not only saving money and reducing energy consumption but also flooding your home with an abundance of natural light. Rooflights capture light regardless of the sun’s position, unlike windows or vertical glazing, and have the ability to fill large structures with natural light. Maximising natural lighting creates a much more pleasant environment and is closely linked to health and other benefits: a sense of well-being has been proven to be related to exposure to natural daylight, as have increased productivity levels. When investing in eco-friendly rooflights, a measure that should be taken into consideration is heat transference, which is a U value. U values are indicators that show how much heat is lost from a building through windows, doors and floors. Heat transference is indicated by a numerical value: the higher the value, the more heat is being lost and the less environmentally friendly that particular building is. A low value indicates more insulating factors and greater energy efficiency. 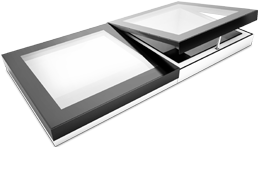 The entire rooflight range from EOS is energy-efficient and boasts U values as low as 0.97 W/m2k. Eco rooflights boast triple glazing and a Krypton gas injection, granting them an even lower U value of an impressive 0.65 W/m2K. The eco rooflights’ U values are so low that official building standards allow them to make up an additional 10% of roof areas compared to other skylights, emphasising the calibre of their energy-efficient properties. Find out more about why U values are important here. Our innovative combination of triple glazing and Krypton gas injection sets the benchmark in energy efficiency and makes our eco rooflights leaders in energy-efficient design and finish. Additional flexibility is unlocked with eco rooflights, as they are available in a variety of sizes ranging from 800x800 to 1000x2000, making them a versatile and fully bespoke option. Looking to increase energy efficiency within your home? Contact EOS Rooflights today for more information on our eco-friendly rooflights range.